The amount of calcium in drinking water is generally determined using atomic absorption spectroscopy (AA) or inductively coupled plasma atomic emission spectroscopy (ICP). Ion chromatography (IC) using acidic elute can also measure total calcium amount regardless of the form in which the calcium exists. Alternatively, the calcium ion selective electrode method measures the amount of free calcium ions. In addition, chelate titration can allows measurement of free calcium ions and part of the calcium bound to other substances. However, by ionizing inorganic acid-bound calcium using a pre-treatment that acidizes the sample, the calcium ion-selective electrode method (LAQUAtwin Ca2+) can be used to measure the total amount of calcium. The following gives an explanation of this, based on empirical data—measured by a variety of methods—on the calcium content of drinking water. For each type of sample, the following table shows the labeled value, together with the values measured by various methods. 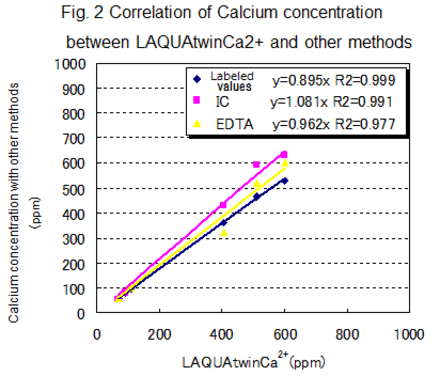 Figure 1 shows the correlation between LAQUAtwin Ca2+ data and that from ion chromatography for pretreated and non pretreated samples. 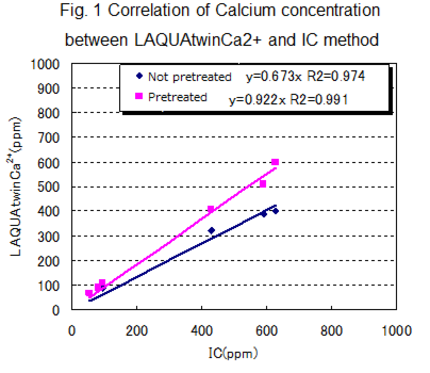 Figure 2 shows the correlation between LAQUAtwin Ca2+ data and that from other methods for a pre-treated sample. Calcium rich mineral water contains calcium sulfate and calcium carbonate, and these were ionized by pretreatment. The data for total Ca amount obtained by LAQUAtwin Ca2+ shows better correlation with other methods when the sample has been pretreated. The same amount of supporting electrolyte was added to both pre-treated and non pre-treated samples. Add 10 to 40 μL of 5M hydrochloric acid to the sample solution in step 1 and confirm that it has a pH of around 2 using LAQUAtwin. Return the sample solution to the beaker. Add 15 to 20 mL of tris-hydroxy-aminomethane buffer solution with a pH of 6.95 to the solution created in step 2 (thereby diluting it by a factor of 4 to 5) and confirm its pH has changed to around 6 using LAQUAtwin pH. As a supporting electrolyte, add 0.0375 g of potassium chloride to 5 mL of pre-treated sample solution, and dissolve by stirring.